Just in time for Passover, a new volume documenting research pertaining to the Bible’s grand narrative about Israel’s Exodus from Egypt has been published by Springer Publishing Company. The book, “Israel’s Exodus in Transdisciplinary Perspective - Text, Archaeology, Culture, and Geoscience,” comprises research presented at a 2013 symposium held at the University of California, San Diego Qualcomm Institute (QI), “Out of Egypt: Israel’s Exodus Between Text and Memory, History and Imagination.” The symposium included a QI-designed exhibition, “EX3: Exodus Cyber-archaeology and the Future,” which showcased alternative interpretations of the Exodus using high-tech display tools in a museum-of-the-future setting. The book appears in Springer’s new book series, ‘Quantitative Methods in the Humanities and Social Sciences.’ Levy notes that the transdisciplinary (team science) approach taken in the book (and emblematic of the research approach at QI) made this project especially attractive to Springer. Some of the world’s leading archaeologists, Egyptologists, Biblical scholars and geoscientists contributed to the book, including Egyptologist Jan Assman (University of Heidelberg, Germany), Egyptologist Manfred Bietak (University of Vienna), Archaeologist William Dever (University of Arizona), Biblical scholar Baruch Halpern (University of Georgia), geologist Amos Salomon (Geological Survey of Israel), Archaeologist Israel Finkelstein (Tel Aviv University) and many more. 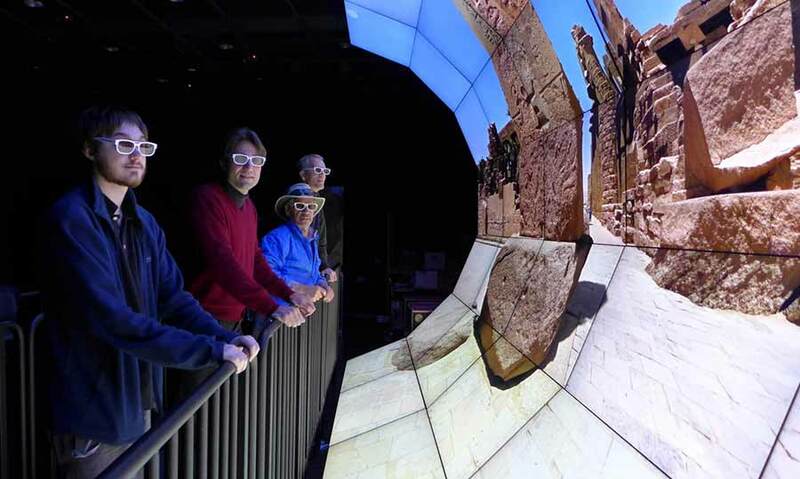 Chris McFarland, Jurgen Schulze, Greg Dawe and Andrew Prudhomme look at a demo from the “EX3” exhibition on the Qualcomm Institute WAVE virtual reality display. Levy added that the combination of 44 contributions by an international group of scholars from diverse disciplines makes the book the first such transdisciplinary study of ancient text and history. One of the chapters was written collaboratively by a number of Qualcomm Institute-affiliated researchers, including David Srour, John Mangan, Aliya Hoff, Todd Margolis, Jessica Block, Matthew L. Vincent, Thomas A. DeFanti, Falko Kuester and Levy. Levy noted that new developments in cyber-archaeology (the marriage of archaeology, computer science, engineering and the natural sciences), new archaeological discoveries and syntheses and the rise of transdisciplinary (team science) in the archaeology of the Holy Land make it possible for ‘scientific storytelling’ to strengthen understanding of the relationship between a sacred text and the archaeological record. “The Bible’s grand narrative about Israel’s Exodus from Egypt is central to Biblical religion, Jewish, Christian, and Muslim identity and the formation of the academic disciplines studying the ancient Near East,” he explained. “It has also been a pervasive theme in artistic and popular imagination. 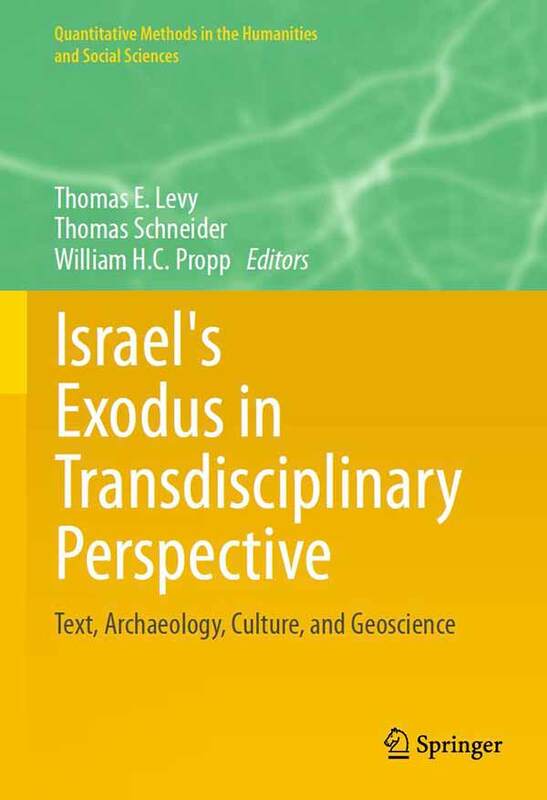 ‘Israel’s Exodus in Transdisciplinary Perspective’ is a pioneering work surveying this tradition in unprecedented breadth, combining archaeological discovery, quantitative methodology and close literary reading.